Lining stress controller under large deformation. An LSC consists of 3 concentric steel tubes. It is used in tunneling to deal with the large deformations of the concrete shells, which form the hull of the tunnel. The post-buckling finite-element analysis required an arc-length control of the load-step-size. 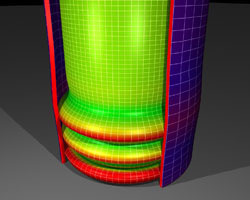 Contact interaction between the 3 tubes was simulated using smooth NURBS surfaces. This strategy helped to avoid numerical problems due to the discretization. Each of the tubes of the LSC was modeled of 3 hexahedral elements in the thickness. This is necessary to reliably simulate the bending behavior.